A new upcoming mobile app named Yolify motivates you to step out of your comfort zone by planning and completing the things you want to do in your life. Yolify builds on the concept of everyone having goals but forgetting about them due to the daily routine of our lives. We feel like we don’t have enough time for anything but the truth is, we are achieving many little things every day, we just don’t appreciate them. That’s what inspired the team behind Yolify to create an app where you can plan and keep track of your goals. Sounds familiar? This is the definition of a bucket list. Once you complete a goal, you can cross it off your list, but the team went one step further. When you open the app a wide variety of goals and ideas are displayed to select from, all created by other users, meaning people are keeping each other inspired by sharing their goals with the community. When you can’t find a specific goal in the app you can create a new one that then becomes available for everyone to complete. Seeing everyone’s goals keeps you motivated to use the app regularly, to extend your bucket list and cross off those little things we tend to forget about. This inspiring concept is paired with the social feature of following other users: by browsing in the app you may find interesting people worth following or others who seem to pursue similar goals as you do. All goals have attributes, such as where and when you completed them, what your experiences were and you can also attach an image to them immediately. Once you complete a goal, you can share it with your friends on Facebook and Twitter. Who wouldn’t want to brag to their friends that their dream of jumping out of a plane came true? This also helps you get more followers as in most mobile apps today. By using Yolify you earn badges that are displayed in your profile and visible to everyone. Some badges have clear descriptions on how to earn them while some have hints that make people curious on how to collect them. 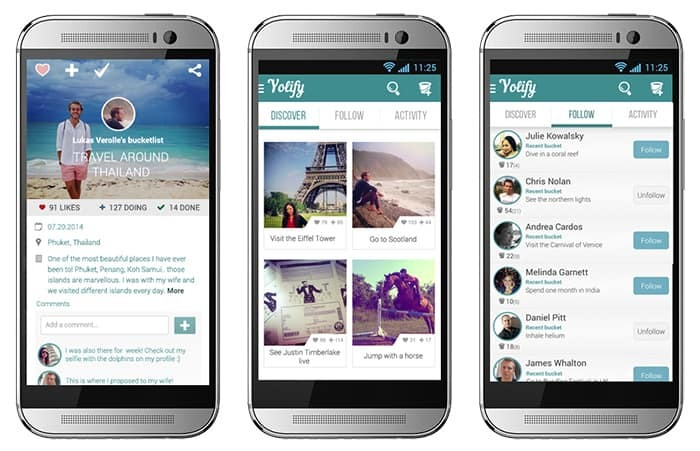 Yolify is available on Google Play for free (iOS version will follow later this year). Yolify is developed by DappWall GmbH, a Swiss web and mobile development company, founded in August, 2013.